In a battle between the two sides with the joint-best home record and best away record respectively, it was the hosts who came out on top, courtesy of a late winner from a man who’s played for both. 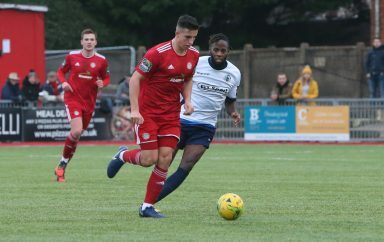 Worthing kept a very similar team to the one that had succumbed to Enfield Town, with Alex Parsons, back from suspension, in for Darren Budd and Callum Kealy preferred to Ollie Pearce, in attack. 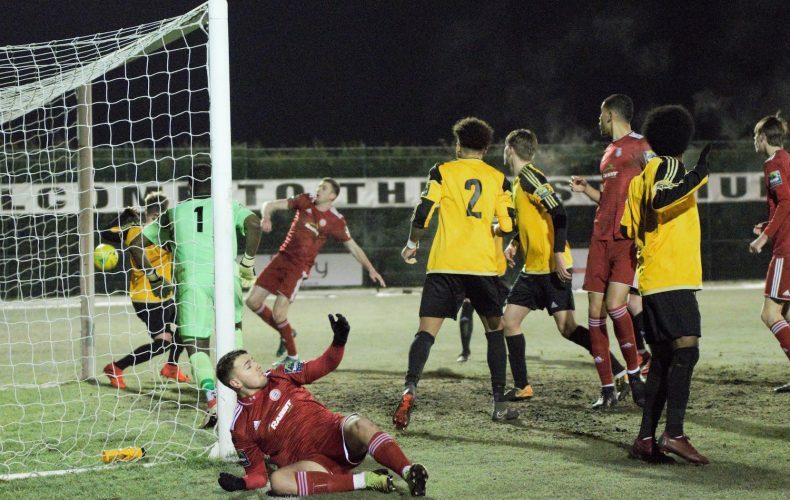 After the visitors appeared to perform a pre-match, modern take on the Hokey-Cokey, Merstham created the opening opportunity on a bitterly cold night, as Kleton Perntreou had to be alert to stop Ollie Cook’s header going in and Jalen Jones prevented his former teammate getting a second bite at the cherry, after only three minutes. Shortly afterwards, David Ajiboye’s blushes were spared when the offside flag meant that his off target effort wouldn’t have counted, should it have been several feet lower. The Moatsiders’ main man, Walter Figueira, found the top of the net, rather than the back of it but merely by a matter of millimetres, before he teed up Gus Sow to come even closer to breaking the deadlock. KP earning his corn again with a smart, low save. Kenny Beaney saw his free-kick comfortably held by our colourful custodian and Ricky Aguiar sliced wide. Ajiboye this time the provider, via James Crane on the left. A luckless Aguiar couldn’t get enough on his set-piece to trouble Amadou Tangara in the home goal, as chances proved hard to come by in the first period. Jones’ ball-winning ability in midfield lead to an opportunity being fashioned out of an Ajiboye-Newton-Ajiboye sequence, with the latter guiding his attempt the wrong side of the far upright. It was that very same piece of apparatus that came to the rescue of the nearly-stunned hosts, when contact with it kept Aguiar’s right-sided corner from creeping in. Ajiboye picked out Will Briers, five minutes before the break but, sadly, from a miscued shot, that lead to the Referee’s Assistant signalling a throw-in and resisting the temptation to whip in a cross. The final say of the half went to Merstham, when their number ten, Fabio Saraiva side-footed wide of goal, after a mini-scramble in the penalty area had seen the ball laid back to him by Sow. Tom Bird shot from distance and Crane was in the right place at the right time to deny Roman Michael-Percil, as the home team made a bright start upon the resumption of proceedings. Harry Osbourne’s first right wing delivery was met (semi-) acrobatically by Saraiva, as his improvised effort marginally missed the target, while his second ended up in the vicinity of Albury Road. That second opportunity nearly had repercussions at the other end of the pitch but Tangara was out smartly to clear the danger, before Ajiboye could capitalise. As the hour mark ticked by, a waddle of penguins, drawn in by the sub-zero temperatures, flapped their wings in eager anticipation of a breakthrough, as possession was gifted to Figueira by the usually unflappable Perntreou. Fortunately for him – but disappointingly for our feathered friends – he wasn’t able to take advantage; the netminder redeeming himself by tackling the forward and Jones doing the same to Sow, before Aguiar mopped up. Danger lurked for Tangara too, with Crane agonisingly close to getting on the end of Ajiboye’s flicked header at the back stick, after Aguiar sent his flag-kick into the mixer. Our goalscoring wing-back featured again, fifteen minutes from time, when his long ball to Zack Newton ended with Bird heading away Ollie Pearce’s curler in front of his own ‘keeper. In between times, a great ball down the right sent Osbourne scampering away and his subsequent delivery into the box was met by Figueira but his touch just wasn’t enough to divert it home. A near carbon-copy outcome befell the number nine, when his low cross from the same side only required someone to get on the end of it at all. Alex Parsons was left for dead, when the fleet-footed forward nutmegged him with an impudent flick and presented Michael-Percil with a chance that Billy Barker got behind, to keep it nil-nil. Little more than a minute later, however and the hosts scored what turned out to be the winner. Michael-Percil’s low, left-sided delivery met by a combination of former Red, Kershaney Samuels and Crane. Samuels credited with getting the decisive contact. The last few minutes saw Jones dig Joel Colbran out a hole, when his slip let in substitute, Calum Davies and Samuels hacked off the line from Ajiboye’s header, after a corner had emanated from Budd’s recycled free-kick, that flashed wide, courtesy of a deflection.